StJ / URW187 Water has held us (Postlethwaite) Good words based on the use of water in baptism, and images of water in creation, parting of the sea, washing and baptism, sung to the familiar tune BUNESSAN (Morning has broken). Highly recommended. Lyrics. AoV1-158 Create a new heart Holy Lord / A new heart for a new world (O'Brien/Watts) Very simple melody, Good words. Also appropriate for confirmation. AoV1-034 Create in me O Lord a heart that is pure / I'll Sing Your Song (Marshall) Good honest song. Simple to sing. TiS 493 / UMH605 / VU442 / WoV697 / ELW445 / GtG490 / CP035 / Cha365 / ZSS191 Wash O God our sons and daughters / Wash us God your sons and daughters (Duck) A good hymn for the congregation to sing before or after a baptism. Sung to the familiar tune BEACH SPRING. AoV1-005 Deep within my heart I feel / Galilee Song (Andersen) This one is quite nice. Chorus has this jubilant "So I leave my boats behind!" part. ATW 432 Girl or boy big or small (Holmes) This would be good for a kids' song anytime we have a baptism. It will help them understand what’s going on. AoV2-085 / MV115 Behold, behold, I Make All Things New, beginning with you and starting from today. A lovely energetic chant from John Bell. Would be great if your congregation gets to know the parts. MV 157 I am a child of God, I am a glimpse of God’s new creation (Harding) This is a really lovely song, and very easy to learn. Probably just the first verse is good for a baptism. Recorded music: Forever Young This song from Bob Dylan is a really beautiful blessing. Lyrics and a video of Joan Baez. MV190 Laughter lit the stars of morning (Pedersen) Lovely lyrics and a simple waltz melody. Has lyrics for both infant and adult baptism or renewal of baptismal vows. *URW106 Here at Jordan's river (Duck) baptism; jordan Sung to NOEL NOUVELET, this challenging song is just perfect for our congregation. I really love this. Great for Baptism of Christ or any baptism. *MV135 Called by earth and sky (Mayberry) Gentle song about the blessings of water, air, soil and fire. While it doesn't explicitly mention baptism, it is really beautiful and would work well. *MV117 By the well a thirsty woman (Stilborn) This is not specifically a baptism song, but it has lovely water imagery, and would work well on a baptism day. The tune will probably need to be taught. AoV2-116 / CH633 / UMH611 / VU444 / AA11 Child Of Blessing Child Of Promise (Cole-Turner Witt) Excellent words to a familiar hymn tune. Lyrics. ATAR590 A child is born (Newton) Uplifting new words for a baptism, sung to the tune JERUSALEM. I am not a fan of the tune; the words would fit well to other standard hymn tunes as well if you would like to use them. New words to old tunes. ATAR603 Warmly he embraced them / More than a sign (Mann) A good song of welcoming children; particularly appropriate for a day when there is a baptism. Tune in II Child of God (Loukes) Elaine's new song is really good and would fit very well with our congregation. While it is still new, may be best to have the congregation sing only the first part, which is the most simple. VU443 God we pray at this beginning (Christopher Redmond) Lovely balanced words to a familiar tune (ABBOT'S LEIGH). New words to old tunes. SFFS 2233 This, this is where children belong (Ritchie) A simple song about the inclusion of children in the church. It would be great to sing this at a baptism. Cha362 Filled with the Joy and Gladness (Merrick) Excellent words for baptism of an infant; quite formal. Sung to the very familiar tune O PERFECT LOVE. New words to old tunes. Here in this place Infant born of human love (Wiltshire) Simple baptism song for an infant. Suggested tune is CAPETOWN. Free sheet music. Iona Were I the perfect child of God (Bell) This lovely song to a simple Scottish folk tune talks about taking up the call of Christ in the midst of doubts and fears. "Then sprinkle water on my brow, as in this place I make my vow to own and love my Saviour now and give myself to Jesus". Lyrics (downloads a pdf) Youtube sample. Cha368 I Come to Be Baptized Today (Adams) Good words and very familiar tune. Would be good if you have a group of people being baptised together. O WALY WALY. New words to old tunes. Cha373 Be In Our Midst O Christ (Cartwright) Good for the end of a baptism of some adults, or confirmation, particularly of young adults; it's the same tune as "This is a day of new beginnings" so will be familiar to some congregations. AoV1-053 / AoVK-82 Receive The Light of Christ (Marshall) Simple round "Receive the light of Christ, May (it) shine within our hears, May the Christ Light fill us with joy and peace". This could be really wonderful for the congregation to sing when the candles are being presented at the end of the baptism. TiS 780 May light come into your eyes (Treagus) A simple benediction or blessing for someone leaving, or being baptised. Taizé / MV164 Christe lux mundi (Taize) A slower, and very simple Taize chant. Only works in Latin. Sound samples, sheet music. 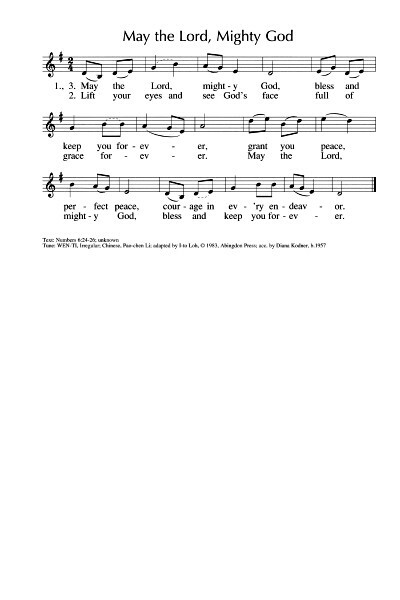 TiS 776(ii) / AHB 572 The Lord bless you and keep you (various tunes, traditional words) The Australian hymn books have two settings for the Aaronic blessing. I prefer tune (ii) rather than the chant version. Oldy-but-a-goody. Iona (Love From Below) The Lord bless you and keep you The Iona community also have a very nice, but very tricky setting of the standard Aaronic blessing words. It’s more something you would ask your choir to sing, if you have one! CH796 The Lord bless you and keep you (Mason) Standard words to a tune by Lowell Mason. *AoV1-177 / GA441 May God Bless and keep you (Walker) Simple and inclusive Aaronic blessing that has words everyone can understand. I strongly suggest having a look at this one as an alternative to the standard Aaronic blessing. *MV218 / GtG549 / STB315 May the love of the Lord / Wei yuan shen di ai (Choo / Lim) Lovely alternative words to a simple Chinese melody. It will need to be taught, but is not too hard. Iona (SBL) / CH787 / PH596 / G(II)413 / GC589 / CP661 / URW445 May the Lord Mighty God (Wen-Ti) Many of these sources are quite masculine, but URW is very good. Sung to a traditional Chinese melody. Lyrics and lead sheet. Sound sample. *AoVK-161 / GC(II)577 / G(3)675 May God bless and keep us (Haas) A nice simple and largely inclusive Aaronic blessing set to the familiar tune ADORE TE DEVOTE. Sound sample. Sheet music sample. Good for kids. New words to old tunes. 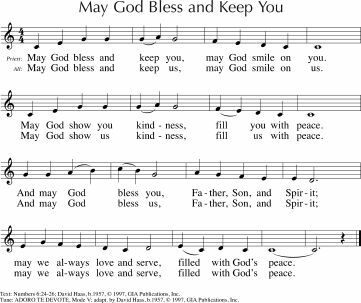 NCYC07 The Lord bless you and keep you / Blessing (Burtenshaw) A nice new tune for the standard words of the Aaronic blessing. Worth a look. Will need to be taught to your congregation, but I can see this being a keeper for more contemporary congregations! AoV2-089 / Taize / MV086 / SFFS 2156 Give peace to every heart / Da Pacem Cordium (Berthier) A good, simple Taize chant. Sound samples, sheet music (not cantor lines though). STB080 May the Lord gracious God bless and keep you forever / Yuan quan-neng zhu shang-di (Loh) This is quite lovely, and when sung in two parts would be really special. You would need to teach it, or to have your musicians sing it often until the congregation get to know it; if the person being baptised is from a Mandarin-speaking family, that would be particularly nice. ATW 494 For you deep stillness (Julie Perrin) This homegrown favourite is just excellent. Lyrics and mp3 sample. BUC Resource May the feet of many walk beside you (Kirk Robson) A beautiful, flowing blessing; much loved by our congregation, both for its beauty and for the person who wrote it. URW444 Go in peace walk in love (Trilby Jordan) A lovely blessing song that can be sung as a round. FFS49 May the God of new beginnings (John Murray) Lovely blessing for a new start, to a simple tune. AoVNG129 / Iona (Common Ground, T1AU) / CH798 / StJ / ELW646 / A&M845 / G(3)820 / ChaP189 / URW446 / StF774 / Lau901 The peace of the earth be with you (Guatemalan traditional / translation: Christine Carson) I really like the energy and the words of this one. Easy to sing. Some versions have "The peace of the Lord be with you" instead. Which is not the same. VU454 May God who creates you (Louise Skibsted) A lovely blessing for a baptism, or a farewell. Lyrics (downloads a pdf). Iona (Common Ground) / URW447 / StF648 God to enfold you (John Bell) A simple blessing. Best if you can have all the parts covered. Iona (T1AU) / URW448 God's eye be within me (John Bell) Based on a traditional Irish blessing, and St. Patrick's Breastplate, and sung to a familiar Irish tune COLUMCILLE.